Sukhmani Sahib is the name given to the set of hymns divided into 24 sections which appear in the Sri Guru Granth Sahib, on ang 262. Each section, which is called an Ashtpadi(asht means 8), consists of 8 hymns per Ashtpadi. 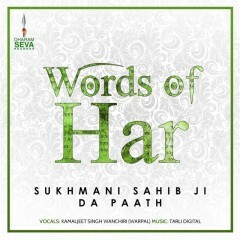 The word Sukhmani literally means Treasure (Mani) of Peace (Sukh). This set of Hymns or Bani is very popular among the Sikhs, who frequently recite it in their places of worship called Gurdwaras and at home. The full recital takes about 90 minutes and is normally undertaken by everyone in the congregation. According to Sikh doctrine, this Bani is believed to bring peace to one’s mind and compoundly peace to the world. This set of 192 hymns were compiled by the fifth Sikh Guru, Guru Arjan Dev Ji. Meditate, meditate, by meditation peace is found. Antagonism and dispute are dispelled from your body. Meditate and Praise the One who pervades the whole Universe. Countless people, in so many ways, chant your(God’s) Name. All say the same Word for the One Lord. That one, in whom even for a second you dwell – their praises cannot be recounted.